It’s the weekend and you want a cooked breakfast, right? Linda McCartney vegetarian sausages (comes in box of 6 and I love the red onion and thyme option). 1 eggs per person – Free-range eggs are better for you and better for the chickens that lay them. Toasted Warburton’s wholewheat squares – brown or seeded (a lighter alternative to bread), or pitta bread. Preheat the oven to 200 degrees Celsius / 400 Fahrenheit or gas mark 6 and put the grill on. The sausages usually take the longest to cook so put them in the oven first. Turn them after 10mins. The sausages should take 15-20 minutes. Slice your halloumi thickly. I usually aim for 6 slices out of a block of 225g. Add them to your oven dish. I use a flat oven dish so the halloumi doesn’t go all over the oven by falling through the wire rack. Slice the tomatoes in half and add them to the oven dish. Place in the oven. Keep an eye on the halloumi. You want it to turn a little golden. Then turn over and brown the other side. Boil water in a pan on the hob, add a table spoon of vinegar, stir the water in a circle to make something of a whirlpool and crack an egg into it carefully, turning the heat down allow the egg to simmer. It should only take a minute or two to poach. 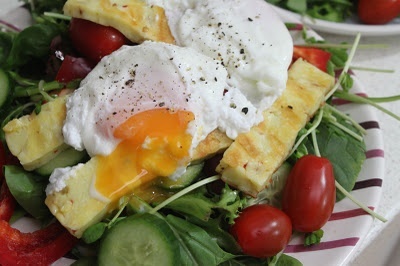 Use a large spoon with holes in it (a slotted spoon) if available to lift poached egg out and place onto toasted Warburton squares or toasted pitta bread. Repeat for the other eggs. Share out grilled food and enjoy your breakfast feast.